That’s right! 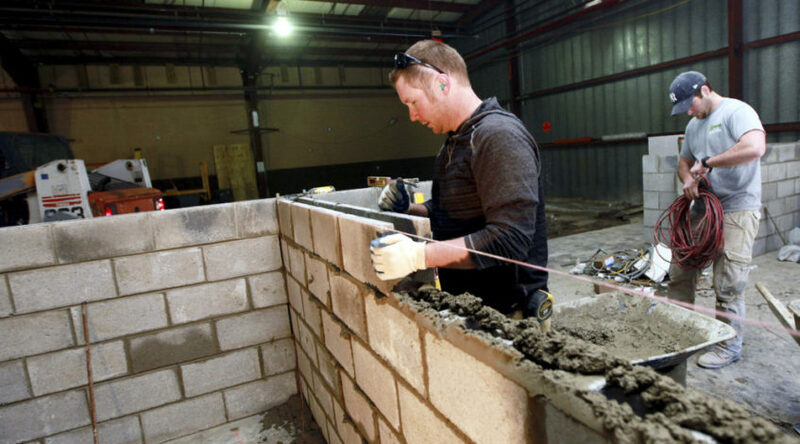 SMC Masonry was in the Herald. 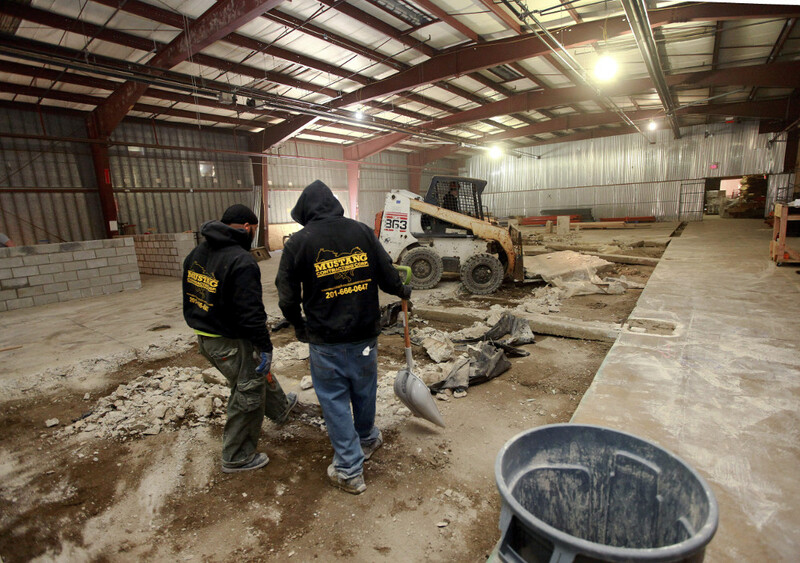 On March 17, 2017 the NJ Herald published an article on the new Krogh’s Brewery construction beginning and featured a great photo of Clayton and I working on the job site! We’re proud to say that the Krogh Brewery job was completed and our clients were happy! NEWTON — The idea began fermenting in Bob Fuchs’ brain about 41/2 years ago — his own standalone brewery from where he could make and sell his own lagers and stouts, IPSs and malt beers. Now work has begun inside the old factory building at 56 Paterson Ave., where, before summer is out, customers will be able to get a taste of the half-dozen or so brews that will constitute the inaugural batch from Krogh’s Brewery. For several years, Krogh’s Restaurant & Brew Pub in Sparta has been brewing its own brand of beer in small lots. The popularity of the brews, which came literally out of the back room, was known regionwide. Fuchs knew there was a market for locally brewed ales, porters and pilsners, he just had to find a place he could turn into a brewery, then deal with the paperwork from the state and municipality. The state, because it regulates such things as who makes beer in New Jersey, and municipality because it regulates everything else, from zoning to what kind of stuff goes into the sewer. Among the earliest moves was for Fuchs to divest himself from the popular restaurant, which he has now sold. State regulations won’t allow him to own both, although he can retain the name Krogh’s Brewery. Finding the suitable place was also a problem, trying to marry up requirements such as a suitable location with access to water and sewer and zoning that would allow a brewery. Thursday marked a milestone in the process — actual construction work to adapt an old factory building into a modern brewery. 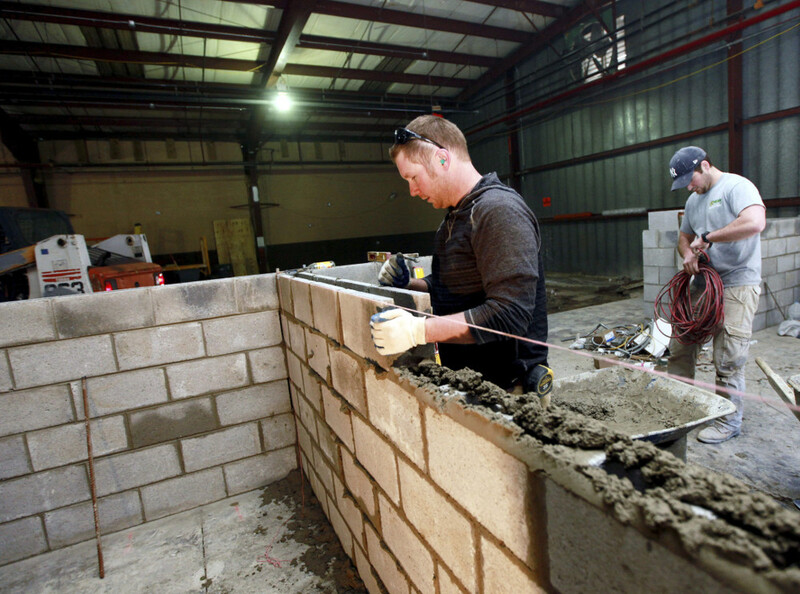 As Fuchs, Ellman and two of their brewers watched, a masonry crew was putting up concrete walls on one side of the empty space. 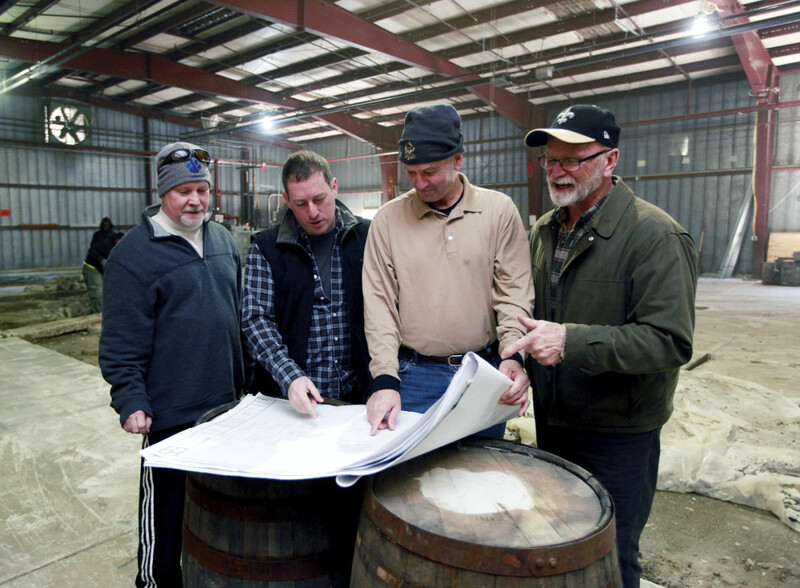 Those walls will enclose office space, said Fuchs, pointing to plans spread out on top of a couple of old wooden barrels, at least one of which was used to age some Russian stout in a mine shaft for about a year. In the middle of the space, a small forklift picked up slabs of concrete that had been cut out. New concrete will have to be poured to support the weight of the big fermentation tanks which will sit there. Initially, the brewery will sell only kegs, “halfs” and “sixtels” (one-sixth of a keg) both to bars and restaurants, licensed liquor stores and to the general public. There will be a tasting room with a small outdoor deck at the room’s entrance. Customers can also bring in their own growlers (64 ounce containers), or buy a Krogh’s growler with beer. Within a year, Fuchs said he expects the brewery will have its own bottling line, starting with cans, which will also be sold to retail and wholesale customers. No decision has been made on which exact recipes will be in the first batches to come out of the brewery, but Cooper and Fuchs noted there will be 6-8 beers available. Over the course of a year, they expect as many as 40 different brews to come out of the fermentation tanks. He said he expects the first beers to come out of the tanks by mid-summer.